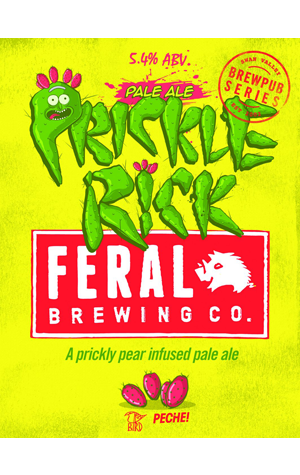 In yet another collab from the Feral Brewing team, the Rick & Morty inspired beer multiverse is explored in the company of Northbridge small bar The Bird and graphic artist Dipesh “Peche” Prasad. Prickly pears handpicked from a Swan Valley neighbour of the brewery were supplemented by locally sourced fruit then combined in a pale ale with Azzaca and El Dorado hops. On launch night at The Bird, while proud of the result, head brewer Will Irving said it likely won't be happening again. The large spikes might grab your attention but, apparently, the fruit's fine hairs are equally painful – it’s almost like the plant doesn’t want to be used in beer. Nevertheless, at least one batch of the beer has been brewed and the overriding impression is … rockmelon. Lots of it, with some strawberry and a little citrus in the background atop a light pale base that shows considerably more bitterness than the fruit characters initially indicate. Artwork from the collaboration by Peche can be seen at The Bird and the artist's Instagram account features behind the scene brew day fun.